over passive subjects, critical pedagogy is situated within a project that views education as central to creating students who are socially responsible and civically engaged citizens. Last fall, I attended an introductory seminar for faculty on open educational resources (OER) in higher education. The seminar was facilitated by a librarian and an online instructional designer but unexpectedly included managers from the on-campus bookstore. What unfolded was not a singular presentation on OERs but two separate presentations: one an informational introduction to OERs and the other a promotional pitch for a proprietary software called Sidewalk that the bookstore is investigating. Sidewalk aggregates textbooks, online resources, and OERs organized by subject and course topics. The presentation of these remarkably different models of educational materials side-by-side exemplifies a disturbing trend in higher education. OERs, often supported by libraries and institutional repositories, de-monetize course materials through creative commons licenses and encourage instructors to create and share materials freely. University bookstores, on the other hand, are a shopfront for the problem OERs address. One system treats information as cultural heritage and one as a consumer product. One system is devoted to creation, adaptability, and challenging who can have a voice in the classroom and one prioritizes consumption and reinforces hegemony. Henry Giroux asks in his article “When Schools Become Dead Zones of the Imagination: a critical pedagogy manifesto”: “...who has control over the conditions for producing knowledge, such as: Are the curricula being promoted by teachers, textbook companies, corporate interests or other forces?” (2014, p. 495) Add to this list proprietary software that advocates for new and “disruptive” methods (disruptive in an economic, not critical, sense) of course material distribution. Why hasn’t critical theory and engaged pedagogy been used to describe and promote OERs within higher education? A language of urgency demonstrates the true necessity, practically and pedagogically, of OERs to make higher education more democratic. This language creates a space for libraries to be crucial support systems to meet these ends. In her seminal text Teaching to Transgress, bell hooks documents the fundamentally racist, misogynist, and authoritarian structure of classrooms in higher education. We, as educators, too often allow unconscious bias and a deeply intrinsic, unspoken belief in education as a banking system1 to mold an educational experience that we cannot celebrate because it does not validate or celebrate us, or our students, as individuals: as whole beings seeking wellness and freedom of body and spirit. The texts we use echo this oppressive system. Instructors represent monolithic, unimpeachable sources of truth as do the textbooks they use. Textbook truth is compiled and edited by publishers using the words of a small group of mainly white, male tenured faculty2. And all the while the student is silent. The student has a voice only to regurgitate memorized information they have collected from the professor and the textbook. If we, as educators, require that students purchase a book, it should be to change their lives, not a grade. The information contained in a book should be so dangerous and so life-changing that we should tell students that they need to have that book forever. They will want to pick it up off a shelf in ten years, read it, and have it change their life again because the transformation of information into knowledge is an essential cornerstone of information literacy and meant to be a lifelong process (Association of College and Research Libraries, 2001). But this critical relationship to knowledge is not supported by higher education, specifically the university bookstores who influence course material acquisition. 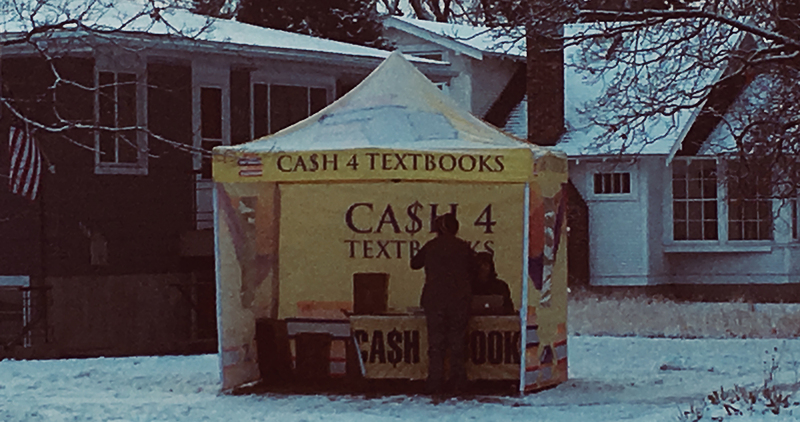 The phenomenon of rental and used books perfectly demonstrates the university bookstore’s treatment of knowledge as capital. Rental and used textbooks disenfranchise students of access to knowledge because they incentivize selling texts at semester’s end. Critical pedagogy “rejects the notion of students as passive containers who simply imbibe dead knowledge. Instead, it embraces forms of teaching that offer students the challenge to transform knowledge, rather than simply ‘processing received knowledges’” (Mohanty, Winter 1989 - 1990, 192). But to university bookstores, at the end of a semester a textbook, by their logic, ceases to have meaning for an individual student. This relationship of student with classroom knowledge is further troubling in its implications that the knowledge imparted in a class loses meaning or utility at the semester’s end. Proprietary software is just one innovation seeking to claim space in the future of higher education, specifically to help students save money and increase student retention. Such software allows university bookstores to work with publishers in a new, but no less predatory, way. In the case of Sidewalk, if a faculty member chooses a text from this software, that fee is assessed to enrolled students through the university’s financial services and the material is made available to students through a course management system for class duration. Sidewalk uses disruptive language like: “We believe content in higher ed needs to be democratized. And it inevitably will be. Faster with Sidewalk than without. And when that day arrives, content will cost less. When it costs less, more students will have access to it. When more students have access to it, their likelihood of success will increase, and the payoff to humanity will be huge.” (“About Us”) Sidewalk the software aggregates OERs, internet resources, and other non-traditional resources with traditional textbooks; it supposedly “disrupts” a model by offering all these materials side-by-side, in one place. Sidewalk’s “disruption” implies a new path that exposes and solves the inequities of traditional modes. But this is not disruption. Sidewalk creates false equality in its aggregation of all types of course materials. In the process nothing is created, everything is presented and consumed equally, and publishers still prey upon students. In fact, software that directly charges students via course enrollment rather than through the purchase of course material corners students who can only afford education through creative avoidance of fees: photocopying library books, borrowing friends’ copies, for example. Publisher profit has thus been maximized. The logical fallacy of Sidewalk’s “disruptive” nature is a frequently utilized conservative tool in politics and business – that is, the primacy of personal success and responsibility. It is the responsibility of individuals (including corporations; now considered “individuals”) to disrupt and fix problems created by social services due to an inherent inadequacy in systems which are not tasked with amassing capital. Liberal ideology, conversely believes that, “Empowerment starts with education and extends to infrastructure, communications, scientific research, and so on. (This) is the basis of democracy: empathy, the caring about one’s fellow citizens that requires social as well as personal responsibility.” (Lakoff, 2011, 186). In recent years public institutions, including libraries and public universities, have been urged to think and act more like businesses. Unfortunately, there has been little recognition across various institutions and stakeholders of how harmful and counter-intuitive that rhetoric is. Sidewalk, Inc.’s ironic secret is their innovation and growth depends on the creation of more OERs. Because what would a business like Sidewalk do without non-commercial, open access-dependent OERs? They would simply be a discovery layer for textbooks and duplicate the functionality of any university bookstore. Just like public infrastructure is taken for granted by the businesses that use them most heavily, Sidewalk exposes its unsustainable dependence on OERs. Without them, Sidewalk is just another textbook search engine, and yet it does nothing to support institutional structures of OER creation. They fail to understand that instead of disrupting they depend on systems and services that are created for a public good without a profit. At the moment, the OER movement is focused on instructors writing and publishing their own course materials. Though this is cheaper and better tailored to the needs and pedagogy of classrooms, the movement fails to be truly emancipatory without meaningful student contribution. bell hooks explains, “Engaged pedagogy necessarily values student expression”. But, it, “does not seek simply to empower students. Any classroom that employs a holistic model of learning will also be a place where teachers grow, and are empowered.”(hooks, 1994, p. 21) The OER course materials model has the potential to be a significant participant in emancipating higher education from burdensome, anti-democratic elements present in a majority of classrooms but only if instructors seize the opportunity to collaborate with students in the creation of course material. “Such a pedagogy listens to students, gives them a voice and role in their own learning, and recognizes that teachers not only educate students, but also learn from them.” (Giroux, 2014, p. 496) Involving students in the creation of educational materials, whether it be for those who take that same class after them or for a another class, functions as an exercise in metaliteracy and meta learning. And in the middle, facilitating these important interactions, are libraries. Librarians and libraries have the skills and mission to fully realize the potential of student-faculty developed OERs. The skills that librarians already possess equip them to organize OERs, curate them, and consider the unique intellectual property issues that may arise. Besides the practical reasons to involve libraries in the development of OERs, the pedagogical foundation that library instruction provides prepares effective student involvement in the creation of OERs. When students and can use a variety of information to synthesize and create new research, they are better equipped to contribute to instructional material in their discipline than peers. The Information Literacy Framework, explicitly directs librarians to teach students how to consider authority as constructed and contextual. Student-instructor developed OERs are the ultimate way to demonstrate how authority is a means to disseminate power, not withhold it. Unfortunately, the equal partnership needed between librarians and teaching faculty is almost unheard of. Deprofessionalization in librarianship, dating back to the 1960s, has meant that libraries, especially academic libraries, are chronically understaffed and librarians are not extended the same privileges as other faculty. Roy Litwin writes in his article “The Library Paraprofessional Movement and the Deprofessionalization of Librarianship”, “The deprofessionalization of librarianship and the transfer of the job functions of librarians to paraprofessionals serve as an opportunity for library administrators to take a greater share of control over library practice and to advance a business framework of metrical efficiency to the fore, displacing the ethical framework that derives from the professional orientation of librarians.” (Summer, 2009, 44) The pervasive commercialization of knowledge further contributes to librarian deprofessionalization: “If the semi-professions are in a weaker position in terms of maintaining their autonomy against forces of deprofessionalization, librarianship has a special problem owing to its ideological opposition to the very notion of a monopoly of knowledge.” (Summer 2009, 54) The ethical priorities represented by OERs could be directly tied to demonstrating the importance of librarianship as a profession. Notice I say could, not are. Actively promoting student-faculty developed OERs is exactly the type “politicized practices” of which Mohanty speaks that assist in our resistance of normative discourses and representations embedded in our commodified higher education system. The knowledge and authority that OERs reclaim from textbook publishers could flow immediately into the hands of instructors and students. If higher education fails to resist and rethink its concept of course materials, proprietary software companies will cement an deeply unjust undemocratic future for higher education curriculum. 2 According to the National Center of Education Statistics, as of Fall 2015, 56% of full professors were white men, and 83% of full professors were white. Dubay, C. (2016). "The Biggest Educational Publishers." BookScouter Blog. Web. Apr 25, 2017. https://bookscouter.com/blog/2016/06/the-biggest-textbook-publishers/. "Framework for Information Literacy for Higher Education", American Library Association. February 9, 2015. Web. December 29, 2017 http://www.ala.org/acrl/standards/ilframework. Giroux, H. (2014). When Schools Become Dead Zones of the Imagination: a critical pedagogy manifesto. Policy Futures in Education: 12(4), 491 - 499. http://journals.sagepub.com/doi/pdf/10.2304/pfie.2014.12.4.491. Grasgreen, A. (2014, Jan. 28). "Options don't stem textbook woes." https://www.insidehighered.com/. Retrieved Apr 25, 2017 from https://www.insidehighered.com/news/2014/01/28/textbook-prices-still-crippling-students-report-says. Lakoff, G. (2011). “The Brain, The Mind, and the Threat to Public Universities.” Representations: 116(1), 185–188. www.jstor.org/stable/10.1525/rep.2011.116.1.185. Litwin, R.. (2009, Summer). "The Library Paraprofessional Movement and the Deprofessionalization of Librarianship." Progressive Librarian: 33, 43-60. EBSCOhost. Mohanty, C.T. (1989 - 1990, Winter). “On Race and Voice: Challenges for Liberal Education in the 1990s.” Cultural Critique: 14, 179–208. www.jstor.org/stable/1354297. “Race/ethnicity of college faculty” National Center for Education Statistics Fast Facts. Web. December 13, 2017. https://nces.ed.gov/fastfacts/display.asp?id=61. Sidewalk, Inc. | “ABOUT US”.Web. Retrieved Apr 25, 2017 from http://www.gosidewalk.com/about/. Note: The opinions expressed here are those of the author and do not reflect an editorial stance of the publication. 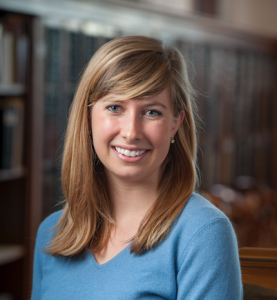 Jaci Paige Wilkinson is an Assistant Professor and the Web Services Librarian at the University of Montana, Missoula. In addition to leading web services, she leads usability testing, chairs the Web Committee, does information literacy instruction and curriculum planning for the information and research division, participates in outreach and communications initiatives, and does research in the areas of usability testing, user experience, metaliteracy, and content strategy. Discussion of "OERs and a Language of Urgency"
Version 21 id 1545804 of this page, updated 11 January 2018 by Shalin Hai-Jew. Created by Shalin Hai-Jew.